As some of you may recall, the first book I read by Elinor Lipman was her fantastic novel The Inn at Lake Devine. Since then I have read Ladies Man (fun but not as good as Lake Devine), and My Latest Grievance (fun and almost as good as Lake Devine). 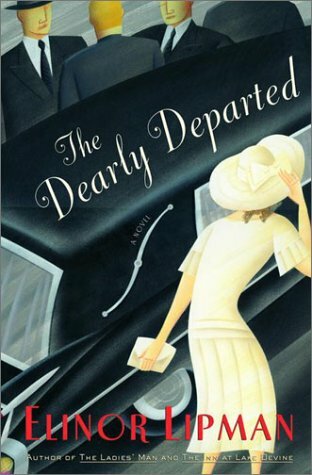 The Dearly Departed is my least favorite of the four that I have read. That is not to say, however, that it isn’t fun and interesting. It is. And Lipman does her usual great job of creating characters that are interesting and likable and a plot that is both fun and engaging. Sunny Batten is the distant, adult daughter of Margaret Batten a single mother who is mostly loved by folks in the small town of King George, New Hampshire. At the unexpected death of Margaret and her somewhat secret fiancé, Sunny is forced to go back to her hometown not only to deal with her grief but also with the same cast of small town characters who made her adolescence less than happy. She is also confronted with the existence of her almost potential stepbrother who turns out to be somewhat more involved in her future than she might have otherwise guessed. As usual with Lipman there is plenty of humor and plenty of good writing in The Dearly Departed. But if you haven’t read Lipman, put this one on the list somewhere after The Inn at Lake Devine. I put The Inn at Lake Divine on my TBR at your recommendation. Looks like I should add at least a few others! My favorite Lipman is “The Way Men Act: A Novel”. Have you read it? Evening Reader: Mrs. B of the The Literary Stew took my recommendation on The Inn at Lake Devine and she ended up loving it. Barbara: I haven't read that one yet. But I plan to read all of her books so it won't be too long before I do. Thomas, thanks for your comment on my interview with Lipman. Without you I still wouldn't know who she is. I never thought she'd even answer my email but she did and that's another reason why book blogging is so great…it just opens up doors and allows contact between readers and authors. I was thrilled to do the interview!